These are just my raw notes that I took when I read the book, Conscious Capitalism, With a New Preface by the Authors: Liberating the Heroic Spirit of Business. 80% of money spent on health care spent on lifestyle …… disease causing…. of Heart Disease, Stroke, Cancer, Type 2 Diabetes, autoimmune diseases. 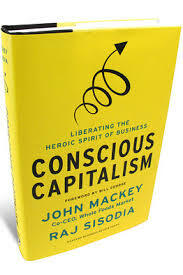 John Mackey - claims that “Conscious” companies out perform S&P500 by 10.5 times - Stock price. Work up through Maslows Hierarchy of needs. Purpose search: (go off site) Discover your purpose. Legacy companies need to discover it. When the company was founded……you can bet there was a higher purpose when it was founded.